The AVE Class 102 or S-102[note 1] (nicknamed "Pato" in Spanish, because of its nose that looks like the beak of a duck, "pato" in Spanish) is a high-speed train used for the AVE service and operated in Spain by the state-run railway company RENFE. Outside of AVE service, Talgo markets this train as Talgo 350. Further production of closely related trains, differing in seating arrangement resulted in the S-112. The AVE Class 102 was constructed by Talgo with Adtranz (later Bombardier Transportation) providing the power car technology. It was principally designed for the Madrid-Barcelona line. The trainsets consist of Talgo passenger cars modified in order to allow speeds of up to 350 km/h (220 mph) with power cars at each end. However, its certified maximum operating speed is 330 km/h (210 mph) due to the limits of its eight 1,000 kW (1,300 hp) motors. The trainsets can consist of up to 12 Talgo series VII coaches. The train is nicknamed Pato, Spanish for duck, due to the aerodynamic design of the power cars resembling a beak. The beak design reduces noise created by air resistance at top speeds. The series trains were intended for a top speed of 330 km/h (210 mph). This top speed was supposed to be enough to fulfill the tender condition of a two-and-a-half-hour travel time between Madrid and Barcelona. Experts ascribe this reduction compared to original plans to budgetary reasons, which derive from the strongly increased power requirements at even higher speeds. RENFE's original order in 2004 was for 16 series units, delivery of which began in 2004. A follow-up order for 30 similar trains to be delivered in 2008-2010 and designated as class 112 (S-112). The first production unit was unveiled in June 2010. In trials with the prototype unit (later used by track authority ADIF as test train Class 330), on 11 October 2002, 362 km/h (225 mph) was achieved. Type approval tests began in 2004. Type approval requires test runs at speeds 10% above the desired permitted top speed. During the approval tests, a new record of 365 km/h (227 mph) was achieved in the early hours of 26 June 2004. After the successful completion of the tests, the first eight series units commenced operation on the Madrid-Zaragoza-Lleida line on 26 February 2005. Initially, maximum service speed was restricted to 200 km/h (120 mph), due to problems with the train control and signalling system on the line. After the commissioning of the train control system ETCS Level 1, the top speed was increased in steps. Since 7 May 2007, the trains travel with the top speed targeted for the time being 300 km/h (190 mph). 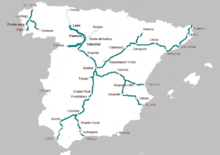 After the stabilisation of the train control system ETCS Level 2, the trains may cover the distance of 621 km between Madrid and Barcelona in about 2 hours 30 minutes, with a top speed of 330 km/h (210 mph). However, presently, non-stop runs are carried by the AVE S-103, while the S-102 are deployed for runs with intermediate stops, with travel times between 2 hours 57 minutes and 3 hours 23 minutes. Talgo 350 trains based on the Class 102 design are to be used on the Haramain High Speed Rail Project line in Saudi Arabia under a contract announced in October 2011. ↑ Talgo America - Very High Speed – Talgo 350 Trainset with Series VII cars Archived 26 December 2010 at the Wayback Machine. 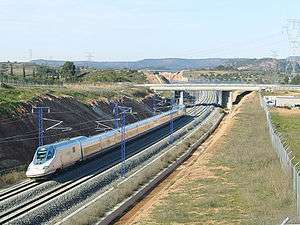 ↑ "El tren AVE S-102 comienza a prestar servicio comercial en la línea Madrid-Zaragoza-Lleida" (in Spanish). RENFE. 26 February 2005. Retrieved 11 January 2009. ↑ "RENFE unveils Class 112 high speed train". Railway Gazette International. 30 June 2010. ↑ "Un AVE con vagones fabricados en Valladolid bate el récord de velocidad en España, 404 km/h". El Norte Castilla. 6 October 2006. 1 2 "Magdalena Álvarez presenta los nuevos trenes AVE S-102]," (PDF). Spanish Transport Ministry. 23 February 2005. 1 2 "Barcelona, nuevo destino AVE" (PDF). Revista del Ministerio de Fomento. Nº 571. March 2008. Retrieved 16 January 2009. ↑ "Civils and signals block speed-up on world's fastest line". 161 (4). Railway Gazette International. 1 April 2005. p. 179. ISSN 0373-5346. ↑ "Spanish consortium wins Haramain High Speed Rail contract". Railway Gazette International. 26 October 2011.